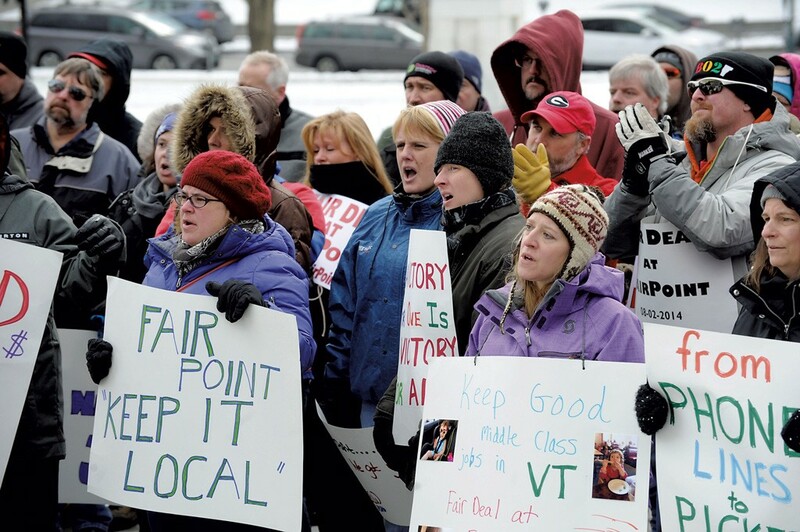 Striking FairPoint employees attended a Montpelier rally in November 2014. Months after going on a prolonged strike to preserve their benefits, 64 Vermont FairPoint workers will lose their jobs because of company layoffs. That's according to the state's labor commissioner, Annie Noonan. FairPoint announced Friday that it's closing the South Burlington call center and laying off 260 employees across the 17 states where it offers internet and phone service. Noonan said 64 of those employees work in Vermont. In a news release, chief executive officer Paul H. Sunu stated, "Access lines and legacy revenues are in secular decline, and we are taking these steps to ensure our administrative and operational structures remain aligned with the current size and composition of our business." Mike Spillane, a representative for the International Brotherhood of Electrical Workers, blamed the layoffs on what he described as "mismanagement" at the top. He said the employee unions will try to persuade the company to reduce the number of layoffs, but he wasn't optimistic. "We’re going to battle them with everything we got," he said. VTDigger and other news outlets, including Vermont Public Radio, have reported on speculation that FairPoint plans to sell to a larger company. Citing dissatisfaction with the current management, Spillane said a sale is "the best thing we can hope for."